KOEI TECMO America today revealed additional details regarding the Synthesis gameplay system and preorder bonuses for the latest title from the long-runningAtelier series, Atelier Firis: The Alchemist and the Mysterious Journey. The game is slated to release on March 7, 2017 for the PlayStation®4 computer entertainment system, PlayStation®Vita handheld entertainment system and on Windows PC via Steam. A new trailer alongside new screenshots and artwork was released today, offering a first look at the game’s new Atelier Tent system as well as a glimpse at the fresh faces who aid Firis on her mysterious journey: Angriff Dahlmann, an aged and hearty mercenary, and a trio of alchemists – the talented Ren Breitner, the carefree Norbert Classen and the clumsy Dion Maier. 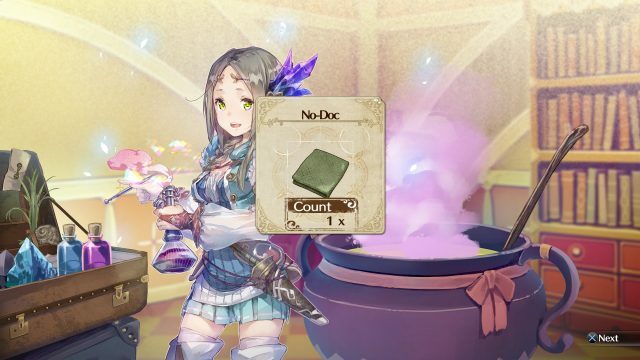 Synthesis is an integral aspect of each Atelier title, and in turn, each alchemist’s adventure! Throughout her unusual journey, Firis will devise handy new recipes as she explores the vast land, encounters new companions, and discovers new materials. To match her wanderlust lifestyle, Firis’s Atelier takes the form of a portable Atelier Tent that enables her to synthesize wherever she may please. The Atelier Tent can even be personalized with a variety of keepsakes from her adventures, making it feel like her second home! A number of preorder bonuses are on offer for prospective players of Atelier Firis: The Alchemist and the Mysterious Journey. Preordering the game from Amazon, Best Buy, EB Games or GameStop will unlock two adorable costumes that provide Firis with useful bonuses: the Resort Vacation costume which increases the chances of finding high quality materials for use in synthesis, and the Wonderland outfit which decreases the time it takes for synthesis and fast traveling between landmarks! The game is set to release on Marchy 7, 2017 for the PlayStation 4, Vita, and PC through Steam.